We have been picking strawberries together each Spring for as long as I can remember. It is always a favorite time together and you can't beat $2 for a huge bucket of berries. Like many newly married couples, my husband and I had many dreams together. We dreamed of a big family and after being married nearly 5 years we had our first child. In 2009, we were pregnant with our third child, following a miscarriage early that same year. I became very ill, quite suddenly; consequently, she was born almost two months early. We discussed getting my tubes tied at delivery, but had not really had time to think and pray about the consequences and finality this surgery would bring. I was so sick, magnesium flowing through an IV as I waited for delivery of our baby girl. I had a definite urge to sign the paperwork and have the surgery done while I was already having my 3rd c-section. This, is where my story of loss, regret and a lot of pain began. I remember laying in the hospital bed recovering and feeling a weight of immeasurable guilt. For years, I would pray about it. I would live with a void, a silent pain very few people ever knew. In 2012, three years later, I was at a yearly exam and discussed my feelings with my doctor. I thought, being over 35, having had three c-sections, and having had pre-eclampsia, she would say I made a smart decision. That something she'd say would make me feel better. Move on. But instead, she told me about a specialist that did tubal reversals and that I needed to see her sooner than later. After extensive praying and testing, I had surgery done in the fall of 2013. Our chances to get pregnant were not high, but we kept praying for God's plan to be known. We prayed for courage to follow. To be obedient. We prayed for healing. I wanted more than just a chance to get pregnant, I wanted to repair my body. Months would pass. I wouldn't get pregnant naturally. We kept praying. We had more testing. We started fertility treatments and months later we were still not pregnant . I went through so many emotions in those years. Not feeling worthy to have another child. Guilt. Inadequacy. Hope. Defeat. Up and down my emotions would go. I would keep seeking Him. I would keep asking Him to make His plan evident. April 2015 came and we finished our last unsuccessful round of fertility medication. I gave it all to the Lord. I finally felt at peace. Sad, but peaceful. I knew we had followed Him. Trusted Him. And through all of it, I had grown so much in faith. I felt like the journey had been His plan all along. The lessons I would learn. The fears I had faced. He had brought me near to Him in so many ways. And then on May 18, 2015, I would see a very faint line on a pregnancy test. The first month without medicines or treatments or timing. Just God and His miraculous provision and timing . I would go on to have a rather challenging pregnancy. Pre-eclampsia again. Bedrest and another premature delivery. On Christmas night, I met this sweet angel weeks before her due date; yet her story began so many years before that night. For so long I felt like something was missing. She was missing. Truly God has already written all of our stories and we just need to trust in His plan and His time. As we celebrate the birth of Christ tomorrow, we will celebrate her birth and life as well. As I hold her, I am reminded of the peace, the hope, and the love I only know because of Christ. I know so many people have stories that are similar. I pray you will hold tight to the promises only He can give. I know the pain you may feel. A silent pain, that perhaps you feel no one else can understand . Take heart, because you are not alone. He is the hope and the light. I sit here still in awe of our Christmas miracle. Thankful for His undeserved love and grace. I would never change our story for something easier or different. I no longer live with regret. I know that every broken feeling I went through and every step I took into the unknown, I grew closer to Him. And there is no gift greater than that. Sharon McKeeman has started a project called turning mourning into joy. Please follow this link to read more beautiful stories of hope. It's hard to put into words how grateful I am to be your mother. Seven years ago you came into our world almost 2 months early. Each year, I think back on that time and feel so thankful for God's plan and provision. You surprised everyone,even your NICU doctor, with your health and growth. He told us you were a Superstar and you have held true to that name. You continue to be full of life and love. You are passionate about creating; painting, making art from whatever you find; using your imagination in beautiful ways. You love to dance and sing. I often hear your sweet voice in the back of the car and it always makes me smile. You are strong willed and tell it like it is. You love with all of your heart and want reassurance that you are important and loved too. In December, you became a big sister. At first you had reservations, but slowly I have seen you take on the big sister role in such a wonderful way. This year you've learned to read, lost your first two teeth, and learned to tie your shoes. I want to remind you to not be in such a hurry to grow up. To stay little. Childhood is such a brief season. I want you to savor every moment of it. Most of all, I love you so much. I thank God for your life and for the blessing you continue to be to us all. God has taught me so much about love and about grace through being your mama. "I love you so much. I'll never forget. " She is just a couple weeks shy of being 9 months old and still sleeps by our bedside. She has definitely been in our room the longest of our four children. Partly, due to space within our home; but mostly because this mama is having a hard time with change. With each 25th day of the month, I am reminded of what a thief time is. I fill with emotions and wish somehow I could go back and do it all again. That I could have more time with each of our children. As I look at our 12 year old, it is a constant reminder that the moments, the days, the years pass quicker than I ever anticipated. Quicker than I was ever warned. We have intentionally made choices to live a slower life. To have more family time. To soak in the present. All of this, has made me feel these moments even more. Love them. Cherish them. Yet, I often end up back here. Nostalgic for what once was. As I lay in bed nursing her yesterday, I thought about the fact that she will not always be in this room with us. She will not always be here in our home. Yes, that reality makes my heart ache, but instead of mourning the loss of time, I decided to take out my camera and capture this present moment. This gift of time. I want to recenter my focus. Not on what we lose with each passing moment, phase, or milestone, but what we gain. What joy we have lived and what we have learned about grace through it all. Today, I read these words from Ann Voskamp and I share them for myself, as much as I share them for others to also be encouraged. "When I am present to the Presence of God meeting us in this moment, I am not worrying, I am not regretting, I am not chaffing, griping, fuming, fretting. Be all here: and be holy. Be all here: and be happy. Because the Presence of I AM always fills the present moment. Be all here and be at peace… content… awake —- Alive. When I am mindful of this moment, the mind fills with God and the heart fills with peace and joy-thanks fills the prayers and isn’t the only way God can come to us is through the door of this moment? Here." I want to be all here. To be Alive in the moments of today. To be at peace. Nothing more and nothing less. This, this is my prayer. This time of year often includes a full calendar with back to school, fall sports, and holidays. But, we cannot forget how important it is to have unscheduled time in our lives. When we have this space during our days, we have time for relationships, time to listen and time to invest in things that nurture us and others. This is vital to thrive individually and as a family. We were not designed to rush through our lives. I have been reading The Best Yes, by Lysa Terkeurst. Her stories are so relatable and filled with thought provoking reminders. I loved her words on allowing space in our lives. I couldn't agree more with this need to have time to connect with those we love the most. Over the last year, I have been documenting the life of my father n law with Alzheimer's Disease in a project called Life with Pito. On Friday, Pito underwent surgery. He had gangrene on his big toe that progressed to a deep bone infection. The doctors tried intravenous antibiotics for several weeks, while cleaning the wound on multiple occasions. They decided that they would amputate the toe in order to prevent the infection from spreading further to his foot and leg. Initially, the doctors thought they'd have to take several toes, but they were able to get all of the infection by only amputating one. Pito's age of almost 81 and Alzheimer's were both added concerns as he underwent surgery on Friday. We are all grateful that the surgery went so well. Pito is now home and healing with Mita (his wife) by his side. Trials in life, such as these, are never easy to walk through. I cannot even begin to really understand the daily journey my mother n law travels with Pito. Her example of love and never ending grace and devotion will stay with me forever. Her faith in Jesus and His plan and His provision continues to guide me on my own walk with Christ. Friday, at the hospital, I was reminded again of what an incredible wife and mother she is. I was filled with so much emotion as I watched her nurse and love him with such care and detail. I don't know if I could continue to be as strong as she is. I know her heart aches as she has watches Pito's health decline and his memory fade, yet, she continues to find ways to praise God for the blessings of each day. She continues to care for him at home and gives him the utmost attention and love. It really is extraordinary. I am grateful that our children could come with us to the hospital to show love and support to their grandparents. In addition, I am thankful that they could witness the beautiful example of family commitment. Family and friends (that are like family) stopped by all day to pray, to encourage, and to show their love and support. We spent hours reminiscing on special memories. What a gift it was for our children to hear these stories and to see this display of love. Family is a gift that I never want our children to take for granted. These people we love, and who also love us, are an integral part of our lives. Friday, was such a reminder of this for me. I am grateful our children could see the example of servant hood and love in such a real way. Many emotions were felt and realized throughout the day. There was sadness and worry of what the future would hold; but ultimately, there was joy in knowing God was with each of us and with Pito. His faithfulness was demonstrated in many ways. Often we talk to our children about putting their faith in Christ, but for them to see this example lived before them, is something that is far greater than our words. After Pito's surgery, we met him back in his hospital room. A smile immediately came upon his face as the children walked to his bedside. He reached out for their hands and kissed them with such tenderness. Later that afternoon, I was talking to Mita about how special this was. She looked at me and reminded me of the prayers we had said earlier in the day and that so many people had also said. And then she told me to be sure that I went home and thanked Jesus for the blessings of this day. She gave Him all the glory, confidently trusting in His plan. Alzheimer's may steal so much from our family, but there are still these brief smiles, connections and moments of love. These are the memories I want to hold on to. These are the moments that I believe keep Mita strong. I pray that these will be the memories that our children remember from their Life with Pito. Pito's life with Alzheimer's has shown me that even when I don't understand why, I can always trust that Jesus is with us. Technically, summer is not over. And in all reality, summer never really ends completely in Florida. Right?! It seems like just yesterday we were closing our books for a few months to enjoy summer break. Yet, here we are starting a new school year. How does it always happen so fast? I savor and linger and the days still fly by with lightening speed. This year our children will be in 5th grade, 2nd grade, and pre-K. It is our fourth year homeschooling. I've learned so much from the past three years and made some changes for the year ahead. I feel like there is an ongoing learning process of trial and error as we teach our children. One thing I seem to forget each year as I am planning our first day back to homeschooling, is that the kids aren't really thrilled to be back to the school routine. And honestly, I can't blame them. We've all had so much fun staying up late, sleeping in, swimming, playing, visiting, and doing fun non-routine activities. I think it is really hard for our children (and me) to say goodbye to the carefree days of summer break. After a few days back to homeschooling, we all realize that it is good for us to add some discipline back in our schedule; and there is still plenty of time for playing. This way of life allows much flexibility to our days (like starting at 9:00 or later) and there can be some positive aspects to routine. Our morning started with a big breakfast, followed by devotional time, and cleaning up the kitchen. When finished, we headed into the school room. This year on our first day we started with a fun activity. Each child answered some questions about themselves and then they shared with each other. We have one child who wants to be a soccer player, another who dreams of map making, and a third who would love to be an animal doctor. They each shared one thing they were good at and one thing they needed to work on. I loved when our 4 year old said she was good at painting, but needed to work on "attitudes." I love her sweet spirit. Our school day ended with tie dye, which we have done annually since our first year homeschooling. The kids look forward to this every year. We finished just in time to head out the door to soccer practice. All three children are playing soccer this Fall, so we spend a lot of time at the fields. To be completely real, our first day wasn't as smooth or joyful as I would have hoped. As I mentioned before, everyone wasn't excited to be saying goodbye to summer, and there was some complaining and irritability. There were times during the day that I felt a bit defeated. Before school that morning, I wrote let your light shine on our chalk board. These four words were ones that I wanted to define our new school year. As the day progressed, I didn't see the light; instead, I felt frustrated and impatient. I have had time to reflect this week. I realized that every year, the first day "back to homeschooling" has been challenging. Day two is always much easier and we begin to have a much better rhythm and flow. Once again, I was reminded of my need for grace for myself and our children. I need to let go of expectations that I sometimes create for all of us. I need to remember that transition can be hard for adults and kids alike. As I look back on the day through the images I captured, I see the day with fresh eyes. I see the relationships between our children, I can hear the conversations we shared during the day, and remember memories we made. I see the light. I see the light of Jesus throughout our home. Sometimes, His light is so subtle, yet it is so beautiful when we really take the time to see it. My prayer for our children is that they will not only let His light shine through them, but that they will take time to see His light every day. I am excited to be joining an amazing group of photographers and friends in a beautiful project called What Looks Like. In mid-July, we headed to Georgia to spend some time in the mountains. It was just the five of us, plus our almost 15 year old lab, Buster. It is hard for me to put into words how much this trip meant to me. We had long meals on the porch, hikes in the woods and hours exploring on the river.We laughed and loved and just lived in ways that we all needed. I didn't realize how much we needed time for just us. Today, I share with you What Time in the Mountains Looks Like. These memories will be in my heart forever. Head on over to see what Jules Trandem's month looks like. She always amazes me with the beauty she captures in her everyday world. “Motherhood is hard work. It is repetitive and often times menial. Accept it. Rejoice in it. This is your toil. Right here. Those are their faces. Enjoy them. The days of your life are supposed to be full of things like this. But joy is not giddy. It is not an emotional rush–it is what happens when you accept your lot and rejoice in your toil. So rejoice in your children. Look them in the eyes and give thanks.” -Rachel Jankovik These words are a wonderful reminder on the days we feel challenged, tired, inadequate, or frustrated. Motherhood is not easy. We all face moments in our days where we feel deep in the valley of motherhood, but then I look at my children and my home that is filled with evidence of their little lives. I am overwhelmed with gratitude for each day we share together. I am overwhelmed with a crazy love that no words can explain. My youngest sister, Katie, will be having their third child next month. Her two girls are 4 and 2 and are excited to welcome a baby brother into their world. Katie has been getting a lot of crazy comments when people see her pregnant with number three. We have been laughing about these a lot lately. One of the most common things she hears is that "your hands are full." I love author Rachel Jankovik's reply to this statement, "yes, they are-full of good things!" God's plan for each of us is so unique and written especially for each of us. I love to see how He works in all of us and I am so excited to see Him work in this next chapter of my sister's family. This week I got to spend some time at home with Katie and her girls. Some days are certainly a bit chaotic, but I know she wouldn't change a thing. I fondly look back on the time when I had a 5 and almost 3 year old who were welcoming their baby sister. It was such an exciting time for all of us. The days flew by like a blur of light. Somehow as I look back, I forget the hard, late nights with a newborn. I only remember the sweet smell, the soft touches, and the new faces. I remember the way my children bonded with one another during those early days, that quickly turned into years. Our baby girl will soon turn five. Yes, this time is fleeting. I am so grateful I could capture Katie with her girls before the new baby arrives. These images remind me of life with little ones. It's a crazy love; one that is really extraordinary. When I began studying photography, Stacey was one of the first photographers I started to follow. Her work always had something special about it that I admired. Over the years we began talking online through email and social media. Last week, we finally met in person when she brought her three awesome kids over to hang out with us for the day. It is such a blessing to see how God really had a hand in our friendship. It is amazing to realize all we have in common, the more we get to know one another. We are such kindred spirits. Stacey was one of those people I felt like I've known forever immediately. We talked and laughed for hours with such ease. I feel so grateful that we got to spend this time together and look forward to another play-date soon. You can see some of Stacey's favorite images from our day together here. I love the words she shares and couldn't agree more. I have found that this phase of life is often very busy as a mama, but having true friendships is such a God given gift. Life was not made to travel alone. I loved that in this one day we were able to share our current joys and difficulties with one another and see how God was working in both of our lives through it all. I was reminded to take time for days like this. We all need to sit on the porch more and open our hearts. It really is good for the soul. She is four and creates art with a passion that overflows from her soul. She lives her life with this same passion. She sings and dances and performs. I am learning so much about life through watching our youngest daughter. She creates art with her life. She doesn't let self doubt or fear stop her. She simply lives. We are all created by God to be artists. Our art is as unique as our lives. Creating art is more than mastering the technical aspects of a trade or craft. Art is something much more than technique. It is what unfolds when we live our lives with passion. It is something that is felt and seen but not measured. I have been reading A Million Little Ways by Emily P. Freeman over the last year. Reading and re-reading. Yes, this book has spoken to me in many ways. I've realized that art isn't merely what we create with our talents and passions but how we live our life. "Art is what happens when you dare to be who you really are. You have the power to influence, to move, to make, to become. You have the capacity to perform the human act of making art, of doing work that comes from deep within you and touches something deep within me." Emily continues, "We make art with our lives. When a mother who thought she had no voice begins to realize her voice matters, a student who believed he was biding his time to live life for real begins to discover life in today, and a writer begins to tell her story, a servant opens his hands, and a believer finally believes--art comes out." As my daughter paints, life abounds from her. She doesn't know it yet, but she is in tune with what makes her alive. I remember when I had our first child, I felt alive in ways that I had never experienced. Mothering and now teaching our children, are ways I create art. I feel alive and I want to glorify God through these passions. You know without doubt when you see someone alive in what they are doing. It could be your child's teacher at school. Or a friend who shows hospitality to everyone who enters her home. A wife who loves her husband the best she can, showing grace and mercy through years spent together. Art is not just what someone creates with a brush or an instrument. It is a way of living your life. Our Maker created us all to live this way, but somewhere along the way we start to forget what makes us feel alive. We can get into our daily routine; sometimes accepting mediocrity, and never take the time to embrace life in the way God intended for us. For many, you know your passion. You know what you would love to do IF you had time and IF you were good enough. Something is stopping you from showing up. There will always be something trying to stop us from showing up. Fear of failure and rejection stands in the forefront. This can be especially true for those perfectionists (such as myself) that want to do it right or not at all. As my daughter creates art she has NO fear of rejection or failure. I have purposely let her create without limitations, so that she can explore and do what makes her feel alive. I have not taught her technique or skills, but given her a brush and freedom. I need to give myself this same brush of freedom. To live and try and fail. To not worry if I will mess up and say the wrong thing or say it the wrong way. I need to give myself the freedom to embrace failure so that I can fully sink into Him. In a world filled with social media, the artist in all of us can freeze. We see the best of what everyone decides to share. Their best work, their best house, their best vacations, their best parenting. We can let this take over and never move, or we can embrace our uniqueness in God and move forward. We are His. I loved these words from Emily. "You are the beloved. So be loved. Receive your belovedness and then hand it out, receive grace and be gracious to others, remember your image-bearing identity and move into the world with a job to do. Show up as you are with what you've been given. And don't allow the voice of doubt and discouragement to hold you back. " God does not want fear to stop us. He wants us to head straight into that fear and realize we cannot do life without Him. Not one of us can. Let yourself fail and know you gave it your heart. My hope is that we would all create our art and hang it with confidence, just as my daughter did with her creation. Many of us never move forward because someone else can do it better. In her book, Emily shares that often we fear that "someone else can write better, love better, lead better, speak better, teach better, design better, parent better or pray better." And the truth is simple. They can. I think many of us need to read and re-read these words that Emily shared from her friend and counselor Steve Lynam, "There is no new truth, dear. All truth belongs to God. Sometimes you simply need to hear someone else say it." Emily went on to say, "You may not be the first to say it, write it, create it, or believe it-but you saying it may be the first time someone finally hears. Yes, someone else can say it better, but that doesn't mean you can't say it too. Throw out your inhibitions and spin around in this crazy world of recycled ideas. There is nothing new to say. Say it anyway." When I read that I just might have shouted Amen. I needed to read that and I believe many of you do as well. I have a passion to use my camera to capture the beauty I see in my family. I could spend my days stifled because someone has already done this and done it better. Amazing photography can be seen daily online or in publications. But, I am not picking up my camera to be better than anyone. I am not picking up my camera for the world. I am using my my God given gifts to create from my heart and ultimately to Glorify Him. This is why I was made to create and I cannot forget this. What does living your life as art look like for you, right now? Not as a child, not ten years ago, but today? Every season will bring with it a new canvas. Open your heart and your life and ask God to show you His purpose for your life. In the final chapter of A Million Little Ways, Emily reminds us that " You are an image bearer and that is not about you becoming famous or important or promoted but about you becoming more fully yourself for the glory of God. And when you are fully yourself, everyone benefits." I challenge myself and I challenge you to really think about these words and to seek Him through it all. Let's create art with our lives. "God is the Artist and he made us. We are his poem and we will make art." The quotes and excerpts I shared in this post all come from A Million Little Ways by Emily P. Freeman. If these thoughts resonate with you, I encourage you to buy her book and read it. And then re-read it. "Uncover the art you were made to live." When Mozi Magazine contacted me to write for their Family and Child issue, I was beyond excited. It means so much to me to be a part of this amazing issue. I am grateful to be able to share a passion that I love so much . Capturing my family and finding the beauty in the everyday is how I create art. My family is the reason I pick up my camera. Realizing that I can be an artist, without being in business, was one of the most freeing moments for me on my journey as a photographer. God has given me these talents and this passion and I pray that I will use them for His glory. He has given me the eyes to see that each day is so far from ordinary and that each moment should be cherished and celebrated. My daughter and I share a love for the song Write Your Story, by Fancesca Battistelli. I never want to forget that my life is His to use. I'm an empty page. I'm an open book.Write Your story on my heart. Come on and make Your mark. Author of my hope. Maker of the stars. Let me be Your work of art. Won't You write Your story on my heart. My Life. I know it's never really been mine. So do with it whatever You like.I don't know what Your plan is. But I know it's good. I am giving away one free digital copy of this gorgeous magazine. You will love the imagery in this magazine from cover to back. It includes so many amazing photographers. Thank you again to everyone at Mozi Magazine for including me in this fabulous issue. And if you can't wait to see if you win a copy, you can purchase a digital or print copy here. It is rare to find any of our children or myself up before sunrise. This week we were up early every day so we could get to Vacation Bible School. One morning we had some extra time before we had to leave. Our middle child and only son loves to fish, so we shared some time together just the two of us. I love when I get time with any of our children one on one. The water and the light were beautiful, but our talks by the lake were the real highlight of this morning. Being still, being quiet, listening, and waiting. None of these things come naturally for me. My mind seems wired to think ahead, to plan, to talk. But the older I get the more I realize how much I need to take time for all of these things. I need them to hear, to know, and to feel God's presence around me. Please visit the Cherish this Day blog to see a collaboration of work from photographers across the world. Each of these ladies were a part of my Everyday Beauty workshop and I am so grateful to know each of them. We are all inspired to capture the beauty in our lives daily. Today we attended Hollywood Studios' Star Wars Weekend. The highlight of the day was when you were invited to be a part of the parade: the Legends of the Force: Star Wars Celebrity Motorcade. You were given light sabers and Jedi robes to wear. It was such an awesome time and one I think we will all remember. Most often on my blog I share my heart on motherhood. For quite a few months, my heart has been stirring about another topic. Marriage. I believe it was Valentine's day when I first started feeling this desire to share on marriage. I kept seeing advertisements and social media posts about love and relationships and it got me thinking about love. What love really is and what is isn't. "None of us ever know whom we marry. And falling in love never made anyone angels… it’s only made it clear how far we’ve fallen. Who we say ‘I do’ to — is not who we roll over to touch twenty years later. The challenge for the vows is to fall in love with the stranger to whom you find yourself married. This is the only way we become married to the right people." My husband and I will be married for 15 years in September. The time has flown by. Many of us have ideas of marriage that begin at a young age. I grew up in a home with two very loving and committed parents. My husband did the same. We are blessed to each have parents that have been married over 40 years. There are many commonalities between our two families: both mother's stayed home full time with the children, both homes had 4 children, both of us were raised in the church. When we got married I thought that all these things in common would mean the picture perfect life for the two of us. There were many things I didn't realize and perhaps, didn't even think about. I had this strange idea when we got married that strong, loving couples would never argue and they would never hurt one another. Our marriage has not been picture perfect. And to be honest, I don't think there is such thing as a perfect marriage. I believe our marriage is one that will last forever through the good and the bad, filled with an unconditional love and commitment, but it isn't a story of "happily ever after". Over the last five to ten years we have seen many of our friends get divorced. Marriage is not easy to begin with, but the military life brings its own set of challenges. It seems that many people are in love with the idea of the perfect life, including the perfect marriage. No matter how hard you try or plan, it will never be that way. We get married and then experience the reality of living life together. We begin to experience the realities of life's hardships and then we see each other through a different lens. For many, it is easier to walk away when life gets hard. A long lasting marriage takes work, commitment and sacrifice. Some people never realize that "the grass isn't always greener". Perhaps, they don't see that other couples have normal arguments and problems to work out. I remember when we first got married, thinking we were the only couple that ever struggled. Our society in general has this idea of EASY. Easy is not the answer to a life of joy, and easy is not the road to a forever marriage. Our marriage would not have survived the past 15 years without Christ at the center of it. Our life together has been through so many highs and valleys. We have endured moves, new life, miscarriage, loss, sickness, war, and more. Life has not been easy. It has been full of blessings, but not without heartache as well. I know that there are circumstances that marriages simply cannot survive. Circumstances that are too much. I understand that and my heart aches for so many that have been through this. But I feel that sometimes we get lost in this idea of what love is and should look like, and when it isn't this way, we feel we have failed. My husband will be the first to share that sometimes his delivery of words is not the most graceful or kind. His expectations for our home, meals, and other daily routines are some times different than my own. Many times I have felt that I wasn't appreciated or doing enough in his eyes. Many tears have been shed under our roof. There were times I got in my car and drove off, without any destination, crying out to God and asking Him why? Through the years, I've seen my husband grow more patient, more appreciative, and more loving, through really giving his life and pursuits to God. I have my own shortcomings as well. God has shown me areas I also need to continually work on. I want to exhibit servant hood as Christ did, not only to my children, but to my husband. I want to live selflessly. I want to show him love that never fails and never gives up. I want to encourage him. To show him I desire him and love him for the man he is. I mess up and fail as a wife many times. But love -- true love, is all of this. It is all of the scars and battle wounds of living together for years. Love isn't a romantic dinner alone. Love isn't a dozen red roses. Love is enduring these valleys of life. Love is getting to know someone for who they really are and loving them just the same. I've sat in the store reading the cards for Valentine's day and thought to myself, that's not how our love looks. That's not how our life looks together. That's not how I feel. It's okay to let go of that idea of love and romance. Its okay to embrace the messy, the less than ideal, the loud, the behind closed doors. Its okay, because all of the hard is what has made our love become something more than an attraction to one another. That is what has defined our love. We were studying relationships in our life group class at church and listened to part of a sermon series by Andy Stanley, an Atlanta based pastor. He said, “Do everything in your power to become the person who the person you’re looking for is looking for. That’s your best chance for success relationally.” These words can be applied to couples already dating or married. Are you being the type of person you want to spend forever with? Are you treating your spouse the way you want to be treated? I have not always been this person. Not by a long shot. On our wedding day one of the readers read 1 Corinthians 13:4-8. Love is patient and kind. Love is not jealous or boastful or proud 5 or rude. It does not demand its own way. It is not irritable, and it keeps no record of being wronged. 6 It does not rejoice about injustice but rejoices whenever the truth wins out. 7 Love never gives up, never loses faith, is always hopeful, and endures through every circumstance. These words mean so much more to me now, almost 15 years later. I want to live out these words. I share this with you today because I want others to know that a love built on growing, living, and being challenged together, can be so much better than "the white picket fence". I will often share how much I love my husband and how grateful I am for his love and the sacrifices he makes for our family, but I want everyone to also know, this doesn't come without work. I once read that falling in love comes easy, but staying in love is the challenge. I thank God for His plan, for bringing my husband and I together to create the family we share and I pray we will share a lifetime more of memories together. I will leave you with these last words from as sermon my husband recently shared with me. The goal of a Christian marriage should be a model to the world of God's love for us. This really is a beautiful way to think of marriage. It isn't easy to live this way daily, but the wonderful things in life are definitely worth working for. 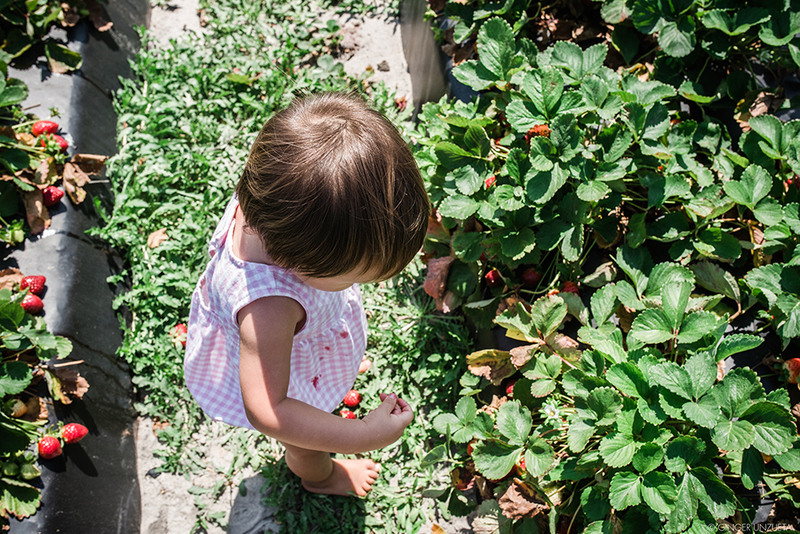 We spent the morning at a local blueberry farm enjoying the blue skies, cool breezes, and sweet berries. Crown Jewel Farms is a beautiful place to take your whole family to experience picking organic locally grown blueberries. The kids all had such a fun time and we can't wait to make lots of smoothies, blueberry muffins and other yummy treats. Head on over to their site to get information about pricing, location, and hours of operation. This week I was listening to the radio when one of the artists began talking about God's purpose for our days here on Earth. He said how many of us are running through life at this incredible pace. He continued to share how many people are living for the day to be over, so they can get to the next day, or the next weekend, or the next vacation. Parents are waiting for their children to get older, so they can do life differently. Many parents, and even students, are wishing away the school year; dreaming of summer, when things will become slower. People are working jobs, with hopes of finding the next better one. Others are waiting for their next big accomplishment; a new house, a new car, a new whatever the "it" thing is for them. God did not intend for our lives to be this hurried rush. He gives us our days to use for His glory and His purpose. I believe He wants us to soak Him in and to take time for relationships with others. He commands us to love others. We can't fully love others if we aren't slowing down enough to appreciate "the now". We aren't ever completely enjoying our days, if we are rushing on to the next one. As I listened to this artist speak, I knew I had been guilty of this mindset myself. Many times my husband has been gone on deployments or overseas for work, and I counted the days down until he returned. The past few weeks have been filled with obstacles in our home. We encountered a broken dryer, a broken fridge, a broken air unit, a flooded bathroom, and a tree falling in our driveway, which had to be removed after smashing our neighbor's car. During these weeks, I let the stress add up, and my days became a blur. I went from one day to the next, just surviving. I have made a conscious effort the past few years to really live a slower pace of life. We home school our children and spend a lot of quality time as a family. We love the outdoors and you can often find us relaxing and enjoying God's beauty around us. We limit our outside activities and commitments and try to appreciate each day. I realized as I thought back on the past month, that I am great at embracing today, until today, goes off course. It is then that I often, let the distractions affect my mood and my focus. God tells us in Psalm 46: 10 to "be still, and know I am God." He doesn't want us to do life on our own. We have to sit still and delight in today for Him. We need to do this so we can hear Him and to be assured that He has our life in His hands. He wants us to come to Him and leave our worries, our problems, our dreams and desires all at His feet. As we do this, we can better enjoy the life we have today, just as it is. This week I have slowly felt our normal routine take hold again. I have spent time being still and it feels exceedingly better than over tired, stressed and empty. These moments of stillness are always good for my soul. One night I watched my youngest while she played with one of her cousins. The big siblings were off at church and these two were enjoying the beautiful summer like evening. I now look at these images and can't help but think how children really embrace today for all it is. They live in the moment and soak up the glory of now. It is a beautiful thing.